By now we’ve shared that slides are not only one of the biggest shoe trends for summer, but they are also one of the key styles for fall. From simple striped options to satin iterations, we’ve seen a range of stylish pool slides over the past few months. Earlier this summer, we shared the “ugly” $30 slides Topshop shoppers were buying at lightning speed, and today, we’re sharing the fall version that’s already selling out. 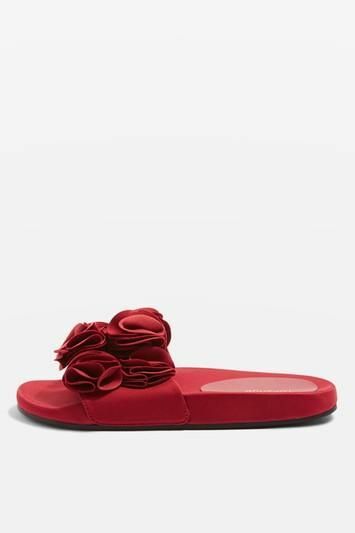 Topshop’s classic pool slides are now updated for fall 2017 with pretty ruffled details and the bright-red color, which, as we’ve mentioned, is the number one shoe trend for the upcoming season. Keep reading to buy Topshop’s pretty red slides. How do you style pool slides? Show us using #WhoWhatWearing on IG.